Mutual funds offer safety and diversification. In addition to that mutual funds also spares investors from the responsibility of stock selection. In short mutual funds is the perfect solution for the people who want to own stocks without doing own research. However, mutual funds have certain limitations. If you are a beginner with good risk taking capacity and willingness to maintain the own stock portfolio, here is simple yet effective idea to make a stock market investment. Invest in stock where mutual funds are investing their money. The fund manager has done enough research before making an investment in the stock. So, chances of such stock giving good return in future are very high. (1) Find out top performing mutual funds or fund house. (2) Refer to only diversified Mutual funds with higher CRISIL Ranking. (3) Select only big fund house and fund manager with expertise to select good stock. (4) Identify top holding of this mutual funds in specific stocks. (5) Choose stocks from different sectors. (6) Make Investment in these stocks either via SIP or lump sum way. You may be thinking that it is easy to provide step like this but difficult to make a stock market portfolio using this method. 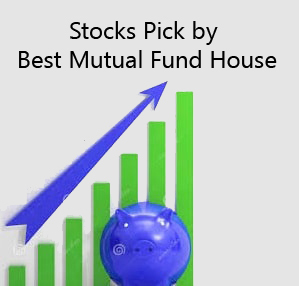 Don’t worry in order to help you I am here with 7 Stock Picks by Best Mutual Fund House. The first stock pick by mutual fund houses is J K Cement. J K Cement is a second largest producer of white cement in India. Big fund house like Reliance and DSP Black Rock has purchased 11.2 Lakh shares of J K Cement in past. J K Cement has given 97% return to the investor in last one year. Looking at upcoming infrastructure projects in India J K Cement is very good stock for investment. The second stock pick is Finolex Cables. In last few months fund house SBI has purchased 18.8 lakh stocks of Finolex Cables. Finolex is leading company involved in the manufacturing of electronic and telecommunication cables. A profitability and growth of the company are very good. Finolex cables have delivered 85% return to the investor in last one year. You can invest in Finolex cable with a price target of Rs.550. Max Financial services is leading insurance service provider in India. Max Financial is another stock pick SBI fund house and Birla Fund House. Max Financial has given 67% return to the investor in last year. Looking at future insurance business Max Financial is a very good stock pick for long term investment. Another stock pick by fund houses is Geometric. Geometric is IT company providing services in engineering and non-engineering segment. Reliance Fund house has purchased 3.6 Cr stocks for Geometric in last few months. Geometric has given 67% return to the investor in last one year. After a merger with HCL Technologies Geometric is very good investment bet. Health Care Global is leading hospital chain known for cancer and infertility treatment. Franklin Temptation has purchased 18 Lakh shares of Health Care global. Health Care Global has given 33% return to the investor in last year. You can invest in Health Care Global stock. Prabhat Dairy is next stock pick by fund houses. Prabhat Dairy is in the business of milk and dairy products. DSP Black Rock has purchased 28.5 Lakh stock of Prabhat Dairy in past few months. Prabhat Dairy has given 30% return to the investor in last one year. Prabhat dairy is a good stock for investment for long term. Karur Vysya Bank is another stock pick for the investment. In last month mutual fund house reliance has purchased 1.13 Cr stocks of Karur Vysya Bank. This purchase is across various scheme of Reliance Mutual Funds. In last year Karur Vysya Bank has given 20% return to the investor. Karur Vysya Bank is a good stock for investment for long term.